The RP Photonics Buyer's Guide contains 22 suppliers for superluminescent sources. Ask RP Photonics what kind of superluminescent source is most suitable for your application. Superluminescent sources (also called ASE sources) are broadband light sources (white light sources) based on superluminescence. (They are often erroneously called superfluorescent sources, which would be based on the substantially different phenomenon of superfluorescence.) Essentially, a superluminescent source contains a laser gain medium which is excited in order to emit and then amplify luminescent light. A superluminescent source has a very low temporal coherence, resulting from the large emission bandwidth (compared with that of, e.g., a laser). This greatly reduces the tendency for laser speckle, as are often observed with laser beams, e.g. from laser diodes. On the other hand, spatial coherence is usually very high: the output of a superluminescent source can be very well focused (similar to a laser beam) and is thus suitable for obtaining by far higher optical intensities than with an incandescent lamp, for example. This makes such devices interesting for applications such as optical coherence tomography (OCT) (e.g. in the medical sector), device characterization (e.g. in optical fiber communications), gyroscopes, and fiber-optic sensors. See the article on superluminescent diodes for more details on applications. The main kinds of superluminescent sources are superluminescent diodes (SLDs) and fiber amplifiers. Fiber-based sources can provide much higher output powers, whereas SLDs are much more compact and also cheaper. In both cases, the emission bandwidth is at least several nanometers and often tens of nanometers, sometimes even well above 100 nm. For all high-gain ASE sources, it is very important carefully to suppress any optical feedback, e.g. via reflections from fiber ends, because this can lead to parasitic lasing. 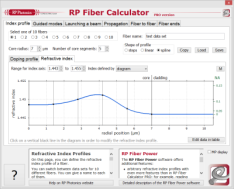 For fiber-based devices, Rayleigh scattering from within the fiber may introduce the final performance limitations. 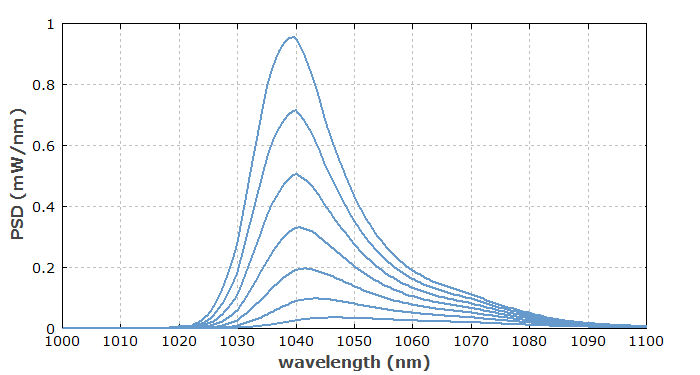 Figure 1: Spectra of ASE from a fiber amplifier, calculated for different pump power levels. With increasing power, the optical spectrum shifts toward shorter wavelengths (where the gain grows more quickly) and becomes narrower. The former effect is typical for sources with quasi-three-level gain media, whereas the latter occurs in essentially all types of superluminescent sources.